You are here: Home / Uncategorized / These Decals Can Do Great Things for Manatees and Sea Turtles! These decals can do great things for manatees and sea turtles. Come in to any one of our locations and pick yours up for a donation of $5.00 (each) while supplies last. Your donation helps to conserve manatees and sea turtles for future generations. 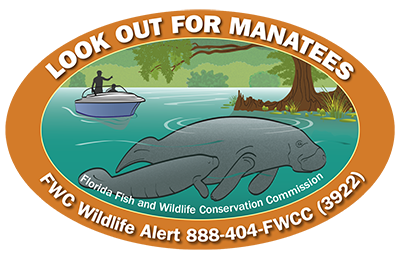 When boating or using a personal watercraft in Florida waters, look out for manatees. Mature manatees grow to 1,000 pounds or more, but can be difficult to see when they’re swimming, grazing or resting underwater. Wear polarized sunglasses, and then watch and listen carefully to detect the signs of manatees nearby. Look for circles on the water’s surface indicating their underwater movement and snouts sticking out of the water as they surface to breathe. You also may hear huffing noises when they come up for air. Over the past few years, the Florida Wildlife Commission has worked very hard to sustain our manatee population. They have made some strides forward, but there is still work to be done. Your $5.00 donation provides funds dedicated to these ongoing efforts. Green sea turtles nest on Florida’s Atlantic and Gulf coast beaches and until recently were classified as endangered. Now after years of conservation efforts, the number of nesting green turtles has increased substantially. This species has been reclassified as threatened under the federal Endangered Species Act. That’s a major step in “green” recovery! Remember “Hands off!” is the best policy for beachgoers encountering any species of nesting or hatchling sea turtle. Watch from a distance, do not disturb them and never use a cell phone or camera to shoot flash photos. 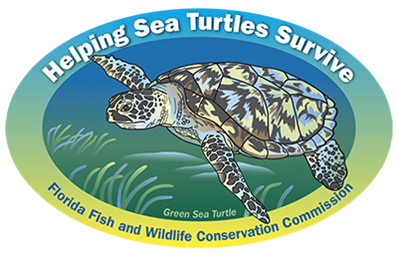 Through research, conservation and habitat management, the Florida Wildlife Commission is working hard to maintain sufficient nesting sites for our endangered marine turtles. Funds collected support these efforts as well as a Sea Turtle Grants Program: http://helpingseaturtles.org/, which supports on-going work around the state. http://www.alachuacollector.com/wp-content/uploads/2017/07/lgseaturtledecal2017-2018_398x257.png 257 398 Jessica Phillips http://www.alachuacollector.com/wp-content/uploads/2013/04/tiny-header-logo.png Jessica Phillips2017-07-26 09:27:552017-07-26 09:45:31These Decals Can Do Great Things for Manatees and Sea Turtles!